I am continuing to post a selection of quotes from O.E. Baker, as I recently discovered them in the book, Agriculture in Modern Life (1939). One of Mr. Baker's great concerns was the loss of farms and farm families from generation to generation and, though he offers some suggestions for helping to reverse the trend, he acknowledges that there is no easy solution. Baker says that there needs to be more economic opportunity in the rural areas of the nation, not only in farming but in small-town industry and home industry. His point being that the rural (agrarian) setting is the best place for families to live and thrive, whether they are farming or not. But there must be opportunity for these people. As a successful example of an agrarian people who have managed to survive on the land, he offers the following observation of the Amish. The last two sentences of this excerpt are an important observation. 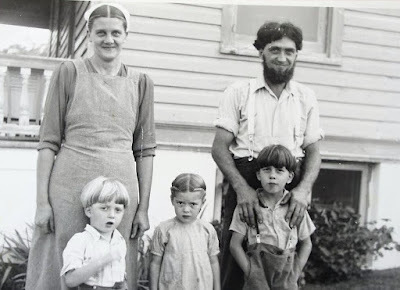 Amish parents are motivated by their religious beliefs, and they appear to be more concerned about their children and family cohesiveness than they are about pursuing the comforts and pleasures of urban life. Recently I spent several days in hilly Tuscarawas County, Ohio, visiting among others an Amish "bishop." He lived in a large white house, simply furnished mostly with excellent home made furniture, and ample in size to accommodate on the occasional Sunday the congregation of 300 people. These people have no church building but meet at the houses of their members. Nearly all clothing is made at home from purchased cloth. Some weaving is still done. Practically all the food is produced on the farm. Their religion forbids the use of automobiles, little light buggies being used instead for local travel. Tractors also are forbidden by most bishops, and regulations are enforced by excommunication, if necessary. The families among these Amish apparently average about 7 children. The bishop I met had 12, of whom 5 were married and living on farms they owned. Two of these farms were mortgaged, but to Amish creditors. The bishop remarked that in his youth there were 6 districts of Amish in the area, and that now there were 24. The districts averaged, he believed, fully as many members as when in his youth. Apparently these people have increased about fourfold in a half century. The children are not encouraged to go beyond the elementary schools, and are encouraged to remain in agriculture by the gift of a farm. Very few, I was told, leave the farms. Among the conservative Mennonites, who are gradually selling their farms to the Amish, the children are encouraged to go to high school, and among the liberal Mennonites a few are sent to college. The highly educated pastor of one of these liberal churches in a nearby village told me he had remaining only 12 farm families, and probably in the next generation there would be only three farm families, the children going to high school and to college and then to town. These Amish people have a philosophy which results in survival and in the expanding occupation and ownership of the land; while the Mennonites, to the extent that they are educated, tend to lose the land, go to the cities, and the families die out. Should education tend toward extinction? For a people, the ultimate criterion of success is survival, and to survive there must be something worthy to live for. These Amish people are living for their God and their children. Herrick, there are ultra-conservative Mennonite who value the same things as the ultra-conservative Amish do, both having very similar community standards and practices. While their community practices and systems are no panacea, we could learn much from them regarding family values and home based economies. Thanks for the link. The writer is from Palmyra, NY, which is not too far from where I am. Interesting, and dismaying, to think that the rise in the number of years that children have been educated over the last few generations directly correlates to the decline of the farming culture. Is it possible for an agrarian country to be an advanced economy (in modern sense)?